FoES analysis of official air quality data shows these locations are breaking legal limits on pollution. What is Scotland’s worst street for air pollution? Glasgow’s Hope Street is top of the charts again this year, with the worst levels of nitrogen dioxide to be found anywhere in Scotland. This will be due, in part, to the heavy traffic loads along Hope Street, particularly older, diesel buses, HGVs, taxis and vans. It is far above the legal limit for Nitrogen Dioxide and Glasgow’s ‘No Ambition Zone’ won’t do much to address this for a long time. 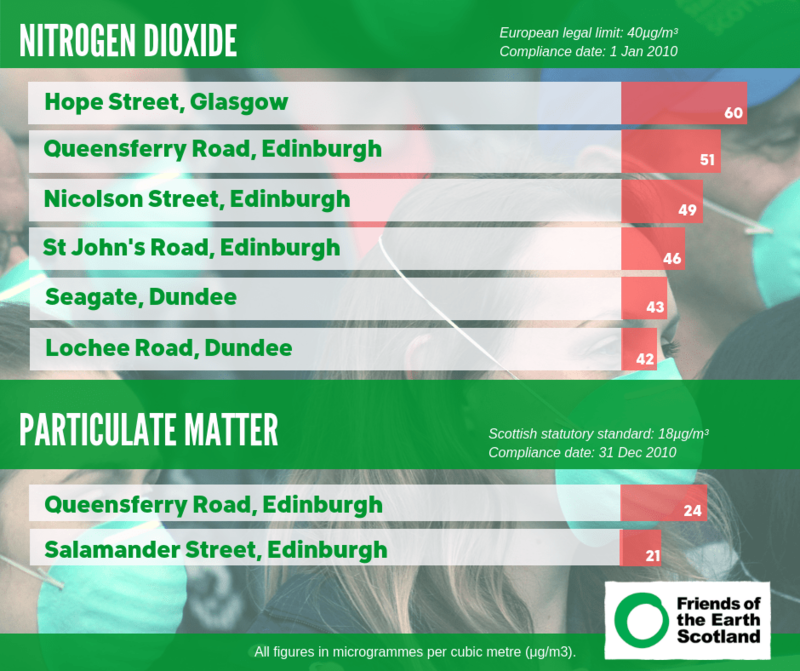 Edinburgh’s Queensferry Road is the worst for Particulate matter pollution. These are fine particles that can attack our lungs and cause a variety of respiratory and heart problems. This is a key arterial road for Edinburgh, carrying heavy traffic all day every day. However, it is also a built-up residential road. People who live on or near Queensferry Road are exposed to illegal levels of air pollution. What is being done to tackle air pollution? City of Edinburgh Council will soon be deciding the size and scope of Edinburgh’s Low Emission Zone. Dundee and Aberdeen should be planning their LEZs later in the year. Decision-makers need to pay attention to what this data is telling us; air pollution is at illegal levels in built up areas where huge numbers of people live and work. Even if your street or town isn’t on this list of pollution hotspots, unfortunately you can’t breathe easy. Experts say there is no safe level of exposure to air pollution. Our air pollution is intrinsically linked to how we travel. If we want to improve the air we breathe, we have to change the ways we get around. That means moving to sustainable transport. Cleaner public transport and safe, comfortable routes for walking and cycling – these are essential for changing our transport mix and reducing harmful fumes on our streets. Share this blogpost using social buttons below. I live on Queensferry Road and my daughter plays outside, who knows what impact this will have on her. This is not acceptable, share on social media to raise this concern please. Local MP also contacted.